Hope Town on Elbow Cay is home to the famous candy striped lighthouse and is arguably the most picturesque settlement in the Bahamas. The first inhabitants of Hope Town were British Loyalists who fled North America after the Revolution in the 1700's and even today there are only 300 permanent residents. No cars are allowed in the town center making it a peaceful and safe place to wander round the quaint shops and historic homes. The Wyannie Malone Museum located in the center of town is definitely worth a visit and is a great source of local information and history. There is so much to do on Elbow Cay that you'll probably want to return here year after year. 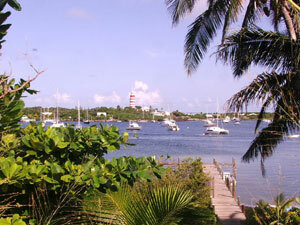 One of the most popular activities is climbing the Elbow Cay Reef Lighthouse for a unique and spectacular view of the Sea of Abaco and the Atlantic Ocean. There are two beautiful beaches lying to the North and East of the settlement offering great shelling, superb snorkeling and for the more adventurous, you can arrange bicycle hire to explore the island in grand style. You may prefer to stroll along the sandy beaches and spend some time relaxing by the pool at the Hope Town Harbour Lodge. Hope Town is also a renowned surfing area throughout the winter and summer seasons.